Depending on your field, a language job may have a different testing requirement. 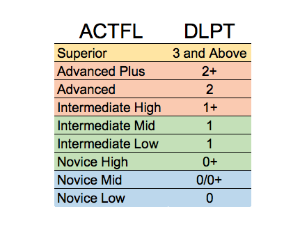 These are the "big three" in language testing, and are widely used standards of language proficiency. The Oral Proficiency Interview (OPI) is the flagship assessment run by the American Council for the Teaching of Foreign Languages (ACTFL). It is a live conversation that ranges from 20-30 minutes, and is usually conducted over the phone. The OPI is designed to determine your speaking level by increasing the difficulty until you can no longer sustain conversation. 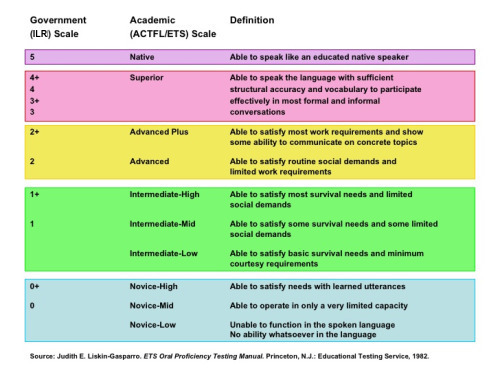 The ACTFL scale was developed from the ILR scale, and has very specific guidelines at each level. 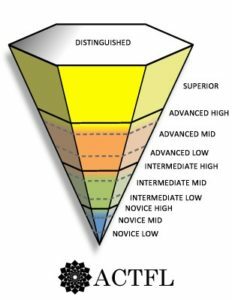 It rates language speakers from Novice to Superior, with subsections Low, Mid, and High. The Defense Language Proficiency Test is a battery of foreign language tests produced by the Defense Language Institute and used by the Department of Defense (DoD). They are intended to assess interviewee's reading and listening skills. Occasionally, the DoD may require an Oral Proficiency Interview (OPI) in addition to the DLPT, in order to judge the interviewee's speaking skills, but this is not part of the DLPT. Developed by the Interagency Round Table, the ILR scale is the standard grading scale for language proficiency for Federal employees. ILR grades on a scale of 0-5 and subsection + when the interviewee exceeds one skill level (reading, listening, speaking, or writing) but does not meet that level for the other skills.